My wishes for a happy and prosperous new year to all of YOU, my readers! I hate to begin a year by discussing potential bad news, particularly when it concerns my favorite town, Norristown, Pennsylvania, but I must. I interrupt my series of posts on ethnicity and immigration to call attention to something that recently transpired within the Pennsylvania state bureaucracy. Consider this a warning about a possible turn of events what would be catastrophic to Norristown’s chances for a revival any time soon. It would also damage those of Bridgeport across the river, as well. Those of you who read this post’s title with alarm, please bear with me. 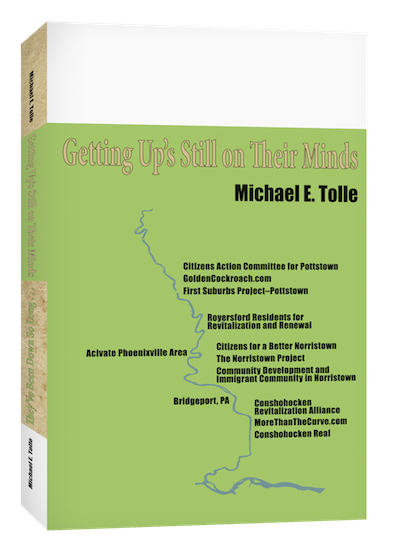 If you are reading this from one of the websites to which I regularly post a link, such as Strong Towns or Urbansim, or one such as Urban Transportation Center Friends, in which I publish when my subject is relevant, my basic point, that the future regeneration of Norristown, Pa., is dependent upon connecting a street directly to a new Turnpike Interchange, is probably not what you want to hear. I am fully aware of the irony when I, an advocate for alternative transportation, support something like a turnpike interchange, but I have my reasons. First, some information about the threat: On November 16, the PA Turnpike Commission issued a press release, one of many in its ongoing battle with the Legislature and the Pennsylvania Department of Transportation (PennDOT) over payments it is required to make, in addition to expenditures on capital upgrades. It issued a list of six capital funding projects, already approved, that may be delayed or cancelled “if future financial or economic conditions dictate.” One of these is the new cashless interchange planned to connect the Turnpike to Norristown’s Lafayette Street. Should this happen, the money spent so far to rebuild Lafayette Street to accommodate the traffic to and from the new interchange would be largely wasted. Norristown, a municipality along the lower Schuylkill River, is the capital of Montgomery County, Pennsylvania. 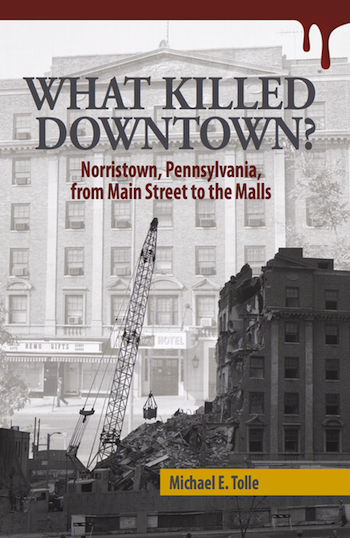 Like its sister towns, Norristown was built on industry. Unlike them, Norristown never developed a dominant industry; variety was its characteristic. For more than a century, Norristown’s Main Street was also the county’s primary commercial retail center. The combination of government, industry and retail commerce built a thriving, prosperous town. Both the industries and the retail stores are gone now. Not all of them, of course, but the town has existed in a type of stagnation since the mid-1970s. In the electronic age, county government no longer brings people to Norristown, so that is no longer much of a prop. The 2010 Census says Norristown has 35,000 residents, but there may be many thousands more living there unregistered. This should alert you to the fact that while Norristown’s economic statistics over the past few decades may deserve the term “stagnation,” the changes in the makeup of its population certainly do not. They have, in fact, been profound, unprecedented and, for the lower Schuylkill at least, singular. Each town along the river was established by portions of the region’s first settlers, largely of Northern and Western European stock. 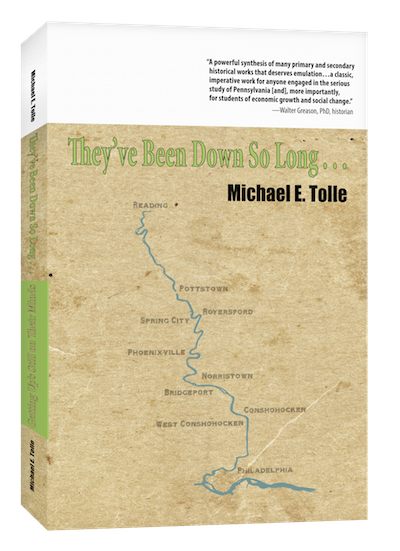 But each grew in size and prosperity because of the waves of immigrants that came up the river (actually on the railroad) from the middle of the 19th century through the first decade of the 20th. Each became a polyglot mixture of ethnicities, but Norristown differed because of the large number of Italians that settled there. Bridgeport’s position just across the river led it to receive a substantial number of Italians also. As I am in the process of arguing in the blog series this post interrupts, Hispanics are today playing the role of Italians from a century ago. One of the main things in common is their concentration in Norristown. We are as yet uncertain as to whether the Hispanics are also “chain migrants” as the Italians were, but comparatively low rents and living expenses are very likely a factor. This, in turn, points to Norristown’s central problem. A general lack of commercial or industrial taxable properties has placed an onerous burden on the residential taxpayers, at least compared to the visible results of their steadily increasing municipal bills. The fact that Norristown possesses far and away the largest number of “Section 8” housing vouchers of any town in Montgomery County, contributes to both edges of the scissors cutting into the town’s loyal, but increasingly frustrated, taxpayers. That’s why I argue that, while no one disputes the need for new businesses, it is fundamentally an improvement in the economic status of Norristown’s residents that is required. In other words, new residents who possess disposable income because they hold responsible jobs. There are two potential paths to attracting such new residents: an increase in both the number and quality of locally available jobs, or a good, quick connection to the local superhighway system, thus allowing new residents to work elsewhere. There aren’t going to be any substantial number of new industrial jobs to underwrite this change. That leaves what I broadly term “service” jobs. Those jobs are going to service the needs of the local population and, hopefully, a substantial number from the suburbs. That makes the jobs/residents dichotomy a “chicken or the egg” type of argument. So, if we focus instead on people who will live in Norristown but work elsewhere, what does Norristown offer to attract such people? Two concerns seem to rank above the rest for the people Norristown desires: the neighborhood and the school system. Norristown offers a decidedly mixed bag in both categories. Norristown does possess the type of older housing stock that finds favor with young people seeking an urban lifestyle. Rather too much of it is in the hands of slumlords, and thus deteriorating, and the heavy presence of “Section 8” doesn’t help, but it’s there, if often in a “fixer-upper” condition. Pubic safety is a mixed bag, as follows in an urban setting described above. You can get an argument about this, but I believe that things are looking up. I am a big fan of Police Chief Talbot and his attempts to better connect his department with the people they serve. The Norristown Area School System offers both positives and negatives, for essentially the same reason as Norristown’s neighborhoods. In fact, I believe that the school system gets a bad rap; it’s a lot better run, and its teachers are better, than standardized test scores would indicate. Two mixed bags will not suffice to bring in the type of new residents that are desired, but Norristown does possess one quite valuable—and exploitable—asset: its frontage along the Schuylkill River. That’s always been valuable, of course; it was where the railroads ran and industries wanted to locate. They have gone, but nothing has replaced them. In my book, They’ve Been Down So Long…Getting Up’s Still On Their Minds, I wrote about what is replacing them in other towns: residences and recreation. What had historically been the riverfront’s lowest priorities have today become its highest. Both residence and recreation offer the river towns much-needed taxables, and even jobs. Young professionals are increasingly drawn to alternative transportation and to residence near beautiful recreational opportunities. Norristown already possesses some of both, but virtually its entire waterfront still lies open and unused, a tempting target for development. This requires another component be added to the mix: I call it “proximity to transportation,” and unfortunately, in Southeast Pennsylvania, that means limited-access highways. The benefits of a close connection to them were first demonstrated in the heretofore sleepy village of King of Prussia, and more recently in both the Conshohockens, just downriver from Norristown. That’s what the now-threatened Turnpike interchange can do for Norristown: provide an almost dedicated connection, offering a quick commute along a recently widened and improved Lafayette Street. With one end at the Turnpike and the other at Norristown’s underdeveloped riverfront, such a Lafayette Street becomes the path to revival. If the new and improved Lafayette Street only dead ends near the Turnpike, then almost the whole point of the project will be lost. I have been focusing on Norristown, but as I noted at the beginning, the Turnpike interchange is an important for Bridgeport also. It lies just across the river, and a widened Lafayette Street with a connection to the Turnpike would offer Bridgeport much the same opportunity to attract new residents, for the same reasons. I've made this point before, but I'll make it again: the futures of Norristown and Bridgeport are linked, just as their pasts are. It’s not time to panic, but it is time to be vigilant. It is also the time to for all Norristown--and Bridgeport--residents to become aware of just how catastrophic the cancellation of the Lafayette Street Turnpike interchange would be. Once that is understood, it is time for them to contact their elected representatives at the state level and beseech them to avoid a decision that would have such a negative effect on both towns. Spread the word. *Norristown already has the area’s best rail connections to Philadelphia; two lines to two locations (the remnants of a much greater system, of course). They are, however, already close to maxed out by development in the Conshohockens, and future expansion of the system would be a shaky reed to lean on.